The QuickFound.net Photo Search page has direct entries for several photo search engines, including Google, Yahoo & Bing, all on one page. wtennisphotos.com displays player photos by Jean-Sebastien Marceau. Tennis.com You can search the Tennis.com website with the form below. Try to be specific--if you simply search for "backhand" you will get countless results, all the articles in which the word "backhand" is used. TennisForm.com is "the definitive online information source for serious tennis bettors." 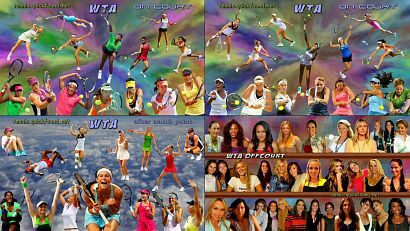 Pro Tennis Fan is a blog site covering both the WTA & ATP, with good player-specific weblogs for many WTA players. String Forum has a database of info on over 1400 tennis racket strings. Racquet Research although not recently updated, has good pages such as "Introduction to Racquet Science," and racquet selection help. College Tennis Online has current collegiate scores, news, and features. College and Junior Tennis adds scores, news and info from and about Junior tournaments. "The 700-year-old French game of tennis, traditionally as much a lady's as a man's game, was introduced to the U.S. in 1874 by a woman, Mary E. Outerbridge..."
See more from this Sept. 9, 1946, TIME Magazine cover story on women's tennis and 1946 Wimbledon and Forest Hills champ Pauline Betz now on the Tennis Articles page. In her first column, the San Diego Union's new Women's Sports Editor Maureen ("Little Mo") Connolly, retired as the world's greatest lady tennis star at a ripe old 21, showed that sports punditry is as easy for her as smashing a tennis ball down an opponents throat. Lamented Little Mo in great pontifical style: "[On] the American scene today ... we're reducing sports to a cluster of numbers on a board ... We ... are expecting our champions to be stadium automatons, the human equivalents of the balls in a super pinball machine ... We're watching for the numbers to light up and forgetting the play." The All England Lawn Tennis and Croquet Club site still has some good Wimbledon history pages. The USOpen.org History has stats and year-by-year finals descriptions since 1968 (but nothing about the Forest Hills and Newport Casino US Nationals before the "Open era"). Apologies for the typographical errors on this page occasionally. These cut-and-paste errors result when faulty brain wiring impairs one person trying to keep up a large website. I try to keep errors to a minimum, but some always creep in.